After divorce, life progresses as jobs and promotions are gained and lost, and health declines. Many changes affect incomes, earning capacities, as well as needs. As these changes take place, a spouse paying alimony may require a decrease in payments, or a receiving spouse may require an increase in alimony. Whether or not a court will modify an alimony order depends on the terms of the original order, the type of alimony awarded and individual circumstance. As state law governs all aspects of divorce, the paperwork and procedure for obtaining a modification can vary from state to state. Typically, for a court to modify an alimony order, the petitioning party must show a substantial change in circumstances. Generally, the change must be unanticipated, involuntary and permanent. For example, if the paying spouse loses his job, the court might consider it a substantial change as long as his own behavior did not result in his termination. If the paying spouse was aware that his behavior was against company policy and could result in termination, the court might consider the termination either anticipated, or voluntary, due to its nature. Retirement is a loss of employment, but because it is anticipated, courts might not consider it a substantial change justifying downward modification. Conversely, an unforeseen disability of the receiving spouse typically constitutes a substantial change for upward modification. Courts often accept cohabitation of the receiving spouse as a substantial change in circumstances justifying downward modification of alimony. Cohabitation means the receiving spouse is living in a conjugal relationship with someone who contributes to her financial support. In such a situation, courts may consider that the cohabiting party's decreased need justifies the modification. There are some types of alimony, such as bridge-the-gap alimony, which courts typically will not modify. A court awards bridge-the-gap alimony only for a specific length of time to help a spouse during the financial transition from married to unmarried. In Florida, for example, modification of this type of alimony is prohibited by statute. Further, courts typically do not interfere with marital settlement agreements that waive the right to alimony modification. When agreements provide for modification only in specific circumstances, courts usually will not consider a modification under any other circumstances, unless they deem the agreement as unfair whereby one spouse grossly took advantage of the other. In these cases, the party who is seeking the modification has the burden of proof to show why the agreement was unfair. A petition for modification typically includes the original alimony award, describes the change that justifies modification, and asks the court to modify the initial award of alimony. A financial affidavit that details the filing spouse's financial situation usually accompanies the petition. Once the party files the petition with the family law court, she then serves the petition and financial affidavit on her spouse. The receiving spouse then has a certain number of days to file a response, after which the court sets a hearing date. 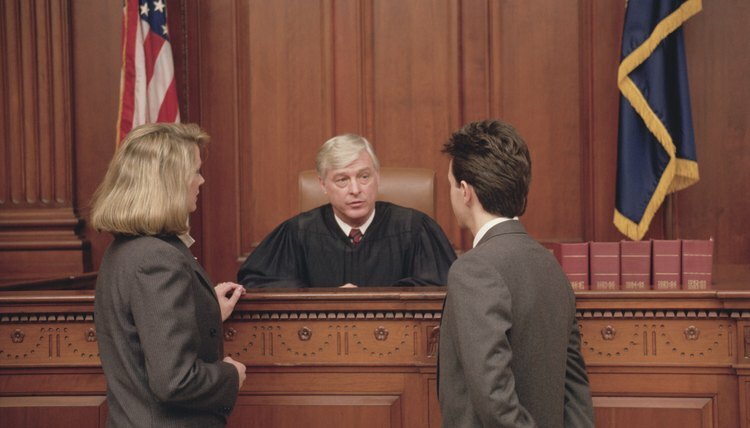 A hearing on the petition to modify, or possibly even a trial, is typically required. At the hearing or trial, the spouse requesting modification must prove the substantial change in circumstances -- and that it is unanticipated, involuntary and permanent. Proof of increased need might include copies of bills, bank account statements and receipts. Proof of the other spouse's increased ability to pay might require a subpoena for these same documents, as well as pay stubs and employment records. Spouses generally live in separate homes after they end their relationship. Although former spouses would likely prefer to move on after a divorce, each person's living arrangements may become relevant to ongoing legal issues between the two parties. In particular, cohabitation with a new partner may affect alimony or child support in Georgia. Accordingly, an ex-spouse should understand the rights and obligations established by Georgia state laws regarding post-divorce issues. After a separation or divorce, spouses often hope to move on and rebuild their lives independently. However, former spouses may continue to affect each other's lives if one of them must provide financial support to the other on a temporary or permanent basis. In West Virginia, a spouse may request alimony, also known as spousal support; state law uses the terms interchangeably. Whether the spouse is entitled to alimony depends on many factors. What Voids Alimony Payments in Nevada? The state of Nevada recognizes two forms of alimony: lump sum and permanent. Lump sum alimony is a specific amount of money the court orders one spouse to pay to the other all at once or in payments over time. Permanent alimony is a monthly amount the court orders be paid upon entry of the final divorce decree. Under Nevada law, permanent alimony ends if either spouse dies or the receiving spouse remarries, unless the court orders otherwise. In certain other situations, however, alimony payments can be voided or at least modified. Can a Divorced Wife Sue for More Alimony?